Konami has revealed details on Pro Evolution Soccer 2015 including a “completely re-worked” shooting system for the PS4 and Xbox One. 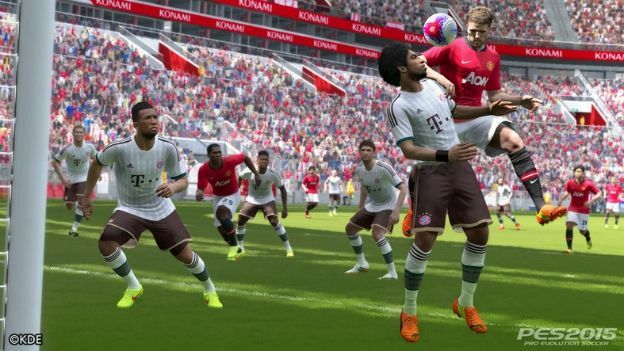 Game developer Konami promises that Pro Evolution Soccer 2015 will deliver "all-new levels" of on-field realism. "PES 2015 sees a true return to core PES values of total control, super responsive controls, and renowned gameplay, where the user has unrestricted control over how they play," Konami said in a statement. This includes the game's shooting system which has been "completely re-worked" to allow for "unrestricted shooting styles" and "precise control" over the direction and power of your shots. Goal-keeping has also undergone changes with a new feature that lets you alter your center of gravity as a means to react to any situation. PES 2015's advanced FOX engine brings new game advancements with it including new animations for over 1,000 players, more detailed and responsive crowds, and a new real-time lighting effect that will better simulate the changing light during a day match or the floodlights for a night game. The myClub mode has also been reworked and lets you add players and managers using in-game currency or with real cash through micro-transactions, rather than purchasing player packs like on FIFA's ultimate team. If you want a slower game you can even tell the groundskeeper to not cut the grass, or to water it to speed things up. PES 2015 launches for Xbox One and PlayStation 4, as well as "additional formats," later this year.